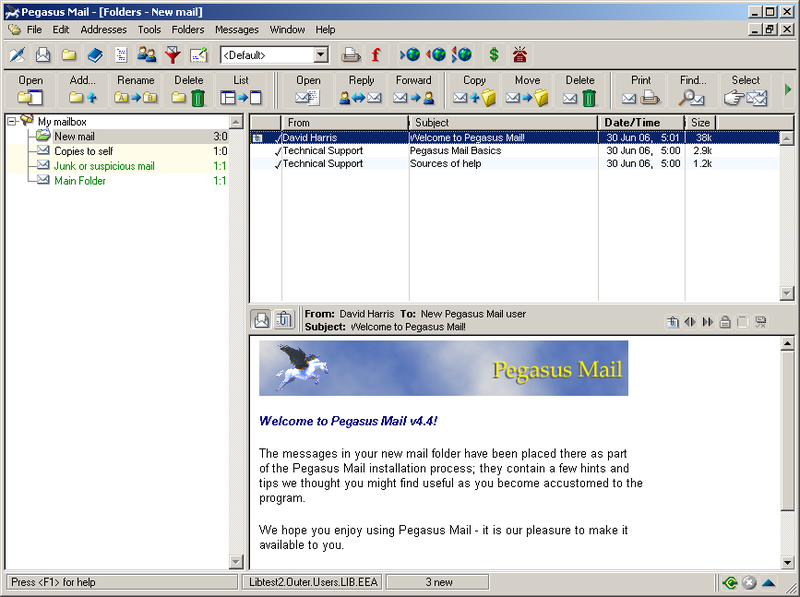 Pegasus Mail is an e-mail client that runs on computers using Microsoft Windows: by client, we mean that it interacts directly with the user, allowing mail to be sent, read, filed, printed and otherwise manipulated through a graphical interface. Probably one of the most feature-rich mail clients available, most users say that they find the program easy to use despite its richness. Small and fast, Pegasus Mail can be left running permanently on the workstation and includes powerful tools to notify the user when new mail arrives. Pegasus Mail does all the basics of e-mail extremely well, and far more than that... This list is by no means comprehensive - it concentrates on the highlights. Multilingual availability - available with fully-translated French, German and Italian interfaces, as well as English. Security, security, security: Pegasus Mail protects you from even the worst HTML-borne virus and trojans, and protects your privacy by intercepting web bugs. Pegasus Mail is immune to *all* the exploits that affect the "other" mailer - browse your mail with genuine confidence. View your folders in either a multi-pane mode (like the "other" mailer) or in Pegasus Mail's powerful "classic" mode, where each folder has its own window and can be manipulated separately. Switching between these views is as simple as clicking a single button. Mail filtering; Pegasus Mail pioneered this in 1991, and it's still the most powerful implementation of automated rule-based filtering you'll find in a mail client. Bayesian filtering - Pegasus Mail's built-in Spamhalter Bayesian filter learns from the spam you receive and automatically files it in your junk folder. Support for multiple users on the same machine as well as on networks. Comprehensive HTML mail generation, in a responsible form - no remote images, scripts or other nasties, just a good range of tables, images and the other formatting you need for real mail. Complete support for Novell NetWare local area networks, in both NDS and Bindery modes. Selective download allows you to preview a POP3 mailbox before downloading it. Offline operation allows you to read and compose your mail while you are not connected to the Internet. Many ease-of-use features, including easily-accessible lists of recently-used addresses, directories and files, and address completion in any address field. Spelling checker, with UK English and US English dictionary, and user dictionary additions. Grouped views allow you poweful extended views of the mail in your folders, including presenting message threads based on their activity. Powerful encryption interface - the program has its own encryptor, and by adding readily available plugins, can support encryptors such as PGP. Noticeboards allow controlled posting and reading in public mail areas, much like Internet news. Optional copies to self ("sent mail" in other programs), with the ability to prompt for a folder where the copy should be placed, and full mail filtering support to file your copies. Circulation messages allow you to send a message or document to successive people in order for comment and amendment. Support for multiple simultaneously accessible POP3 and IMAP mailboxes. ... and much more. The program is free - download it and see if it has the features you need.